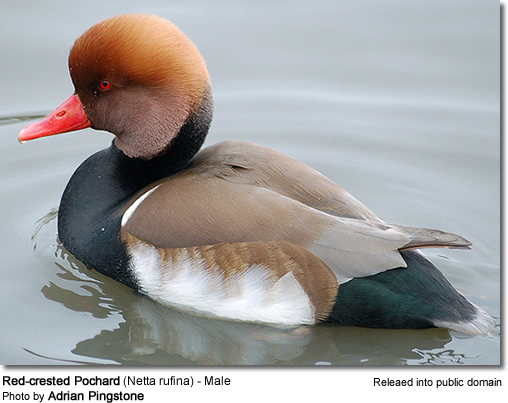 The 15 or so living species of diving duck, commonly called pochards or scaups, are part of the diverse and very large duck, goose, and swan family, Anatidae. The latter article should be referred to for an overview of this very large family of birds. 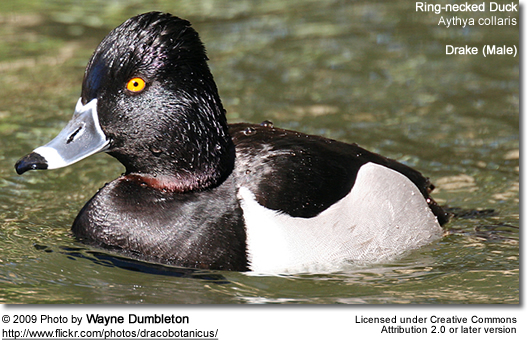 The diving ducks here are placed in a distinct subfamily, Aythyinae. While morphologically close to the dabbling ducks (Livezey, 1986), there are nonetheless some pronounced differences such as in the structure of the trachea. 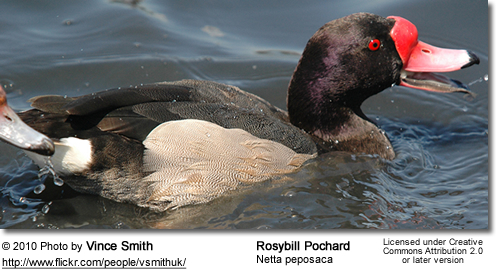 mtDNA cytochrome b and NADH dehydrogenase subunit 2 sequence data (Johnson and Sorenson, 1999) indicate that the dabbling and diving ducks are fairly distant from each other, the outward similarities being due to convergent evolution. Alternatively (e.g. 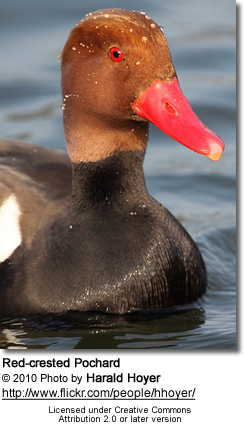 Terres, 1991), the diving ducks are placed as a tribe Aythyini in a subfamily Anatidae which would encompass all duck-like birds except the whistling-ducks. The seaducks commonly found in coastal areas, such as the Long-tailed Duck (formerly known in the US as Oldsquaw), scoters, goldeneyes, mergansers, bufflehead and eiders, are also sometimes colloquially referred to in North America as diving ducks because they also feed by diving; their subfamily (Merginae) is a very distinct one however. 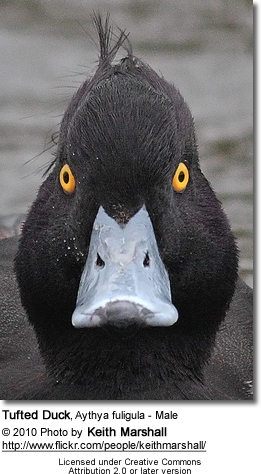 Although the group is cosmopolitan, most members are native to the northern hemisphere, and it includes several of the most familiar northern hemisphere ducks. This group of ducks is so named because its members feed mainly by diving, although in fact the Netta species are reluctant to dive, and feed more like dabbling ducks. 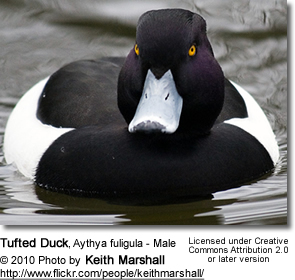 These are gregarious ducks, mainly found on fresh water or on estuaries, though the Greater Scaup becomes marine during the northern winter. They are strong fliers; their broad, blunt-tipped wings require faster wing-beats than those of many ducks and they take off with some difficulty. Northern species tend to be migratory; southern species do not migrate though the Hardhead travels long distances on an irregular basis in response to rainfall. Diving ducks do not walk as well on land as the dabbling ducks; their legs tend to be placed further back on their bodies to help propel them when underwater. Here, three genera are included in the Aythyini. 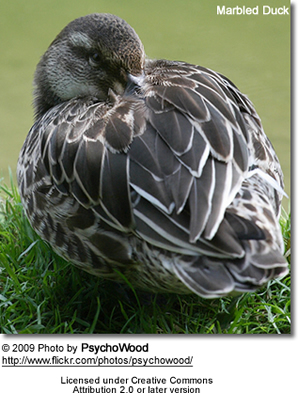 The Marbled Duck which makes up the monotypic genus Marmaronetta, however, seems very distinct and might have diverged prior to the split of dabbling and diving ducks as indicated by morphological (Livezey, 1986) and molecular characteristics (Johnson and Sorenson, 1999). 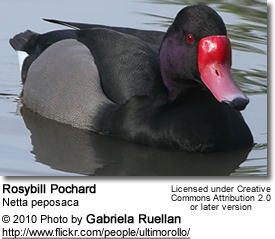 The probably extinct Pink-headed Duck, previously treated separately in Rhodonessa, has been suggested to belong into Netta (Livezey, 1998 contra Livezey, 1986), but this approach has been questioned (Collar et al., 2001). DNA sequence analyses, which would probably resolve this question, have not been conducted to date for lack of suitable material. It might be an early divergence from the dabbling duck lineage (Livezey, 1986). 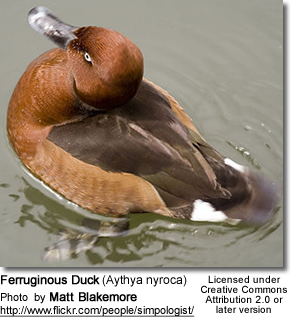 The molecular analysis of Johnson and Sorenson (1999) also suggests that the White-winged Wood Duck should be placed into a monotypic genus Asarcornis which is fairly close to Aythya and might belong into this subfamily. Johnson, Kevin P. and Sorenson, Michael D. (1999): Phylogeny and biogeography of dabbling ducks (genus Anas): a comparison of molecular and morphological evidence. Auk 116(3): 792–805. Livezey, Brad C. (1986): A phylogenetic analysis of recent anseriform genera using morphological characters. Auk 103(4): 737-754. 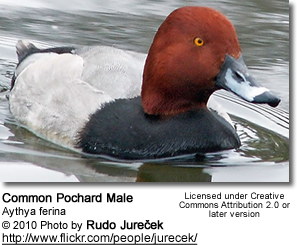 Livezey, Brad C. (1998): A phylogenetic analysis of modern pochards (Anatidae: Aythyini). Auk 113(1): 74–93.